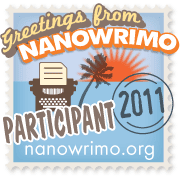 Lillie McFerrin Writes: NaNoWriMo: Halfway There! It’s thirteen days into my first NaNoWriMo attempt, and I’m feeling pretty good. Two hours ago I reached twenty-five thousand words. Half way there! The best part - I adore my characters. This is a new style of writing for me. It’s been a great thing, because I often get stuck in an edit-as-I-go routine, which slows me down considerably. The need to reach a particular word count in a limited time frame has forced me to dig in, put my head down, and keep typing. Another huge contributor to my word count are my amazing Twitter buddies. Writers are a supportive, motivational group. They truly want each other to succeed and write their very best. So, go visit some of these amazing writers! Where are you in your NaNoWriMo progress? What has helped you so far? Congratulations on hitting 25k! My own novel (not for NaNoWriMo) is at 5,559, so I admire you for writing so much in so little time! Please promise me you'll let us WOWers know when you publish your novel so we can read it! Congrats on reaching the halfway point!! I just got there today as well. And I'm still loving my character and the story too. This is usually about where I start to hit a slump, but I'm still going strong. I'm also a reformed pantser. having at least the major scenes has really helped, but I've also cut and added scenes to what I had planned and moved some things around. I like the plan to be flexible so I can change it depending on how the story is going. Good luck on getting the rest of your novel written! Thanks for following my blog! Good luck with NanoWriMo! Yay, Rain and Fallon! Keep going! You are on a ROLL! Congratulations! Keep it up! Way to go Lillie, I'm happy for you! I think you are well on your way to reaching the 50k! Thanks for the shout-out! I have been astounded at all the amazing writers who have just come out of the woodwork to encourage and cheer one another on, and help each other out of their plot entanglements, etc. I will miss this when November ends! How fantastic and days early! Even better. I reached 25k just before midnight on the 15th.